When it comes to brow shaping, in the traditional makeup industry, a lot of aspects take form, and I am pleased it has enabled me to carry it over to my new found added profession of cosmetic tattooing! When I briefly worked strictly in the fashion indus- try, I felt my skills were not being challenged, as I was working exclusively with young woman with perfect- ly symmetric features! Television work offered more of a challenge because I was now in a situation where I worked with all ages, uneven symmetry, and not just women, but men as well! I was often complimented for my brows. Unlike cosmetic tattooing where you can use tools to implement and perfect a design, in my television makeup job, often time was a huge and very limiting factor. We were given twenty to thirty minutes before the newscast pro- fessional was due on camera to read the news bulletin, to make them look fabulous. There was abso- lutely no time to whip out my rul- er, or my golden ratio measuring tool. I simply had to estimate brow evenness and shape, and then work as fast as possible. 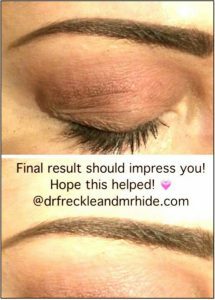 Because of this time pressured process, I developed and refined my artistic ability to assess and design brows with all the obvious considerations necessary to frame the face and enhance the appearance! 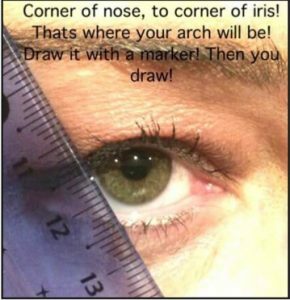 It is now an almost automatic process to determine whether the eyes are wide or close set, where the eyebrow needs to end, where the arch should go, and everything else required to produce quick, but perfect brows! In the case of cosmetic tattooing, time spent designing the brow template is also an important aspect of the procedure in that it needs to be accomplished as quickly and effectively as possible to allow adequate time for the actual procedure. 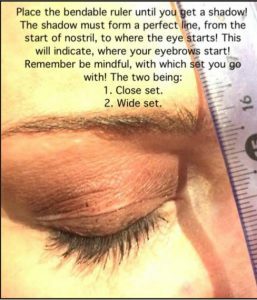 The process now is to quickly produce the brow design and assure symmetry by using a small bendable ruler. By using a dark very sharpened, and more waterproof eyebrow pencil, my design is now more likely to have that stay-on power to keep the template intact. The dark pencil enables me to quickly assess the eyebrow shape and more easily see if they are even or require adjustment. The most important step in my process is taking photos upside down of the client, and then rotating the picture to get a clear and more objective vision of where I need to even out the brow! This is a lesson stemming back from my artistic background where we were taught to copy a picture whilst it was upside down, so as to not be distracted by what we thought we were seeing. Once the picture (or photo) was then turned upright, the similarity or differences were profound and easy to see. I’m also a big believer that time taken in the design process is imperative, especially as the results are permanent! It is typically accepted that wide set eyes have a space greater than one eye width between the beginning (heads) of both brows, and close set eyes will have less than that amount. In general, close set eyes are not considered as attractive as wide set eyes. Therefore, close set brows would also not be considered attractive either. 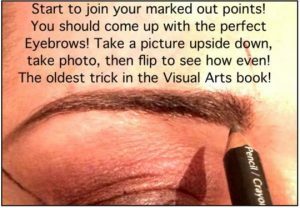 This might be information to share with a client pushing for brows that start closer together than what is considered more flattering. If you struggle with the concept of close set versus wide set eyes, it may help to have a visual example of both types to make the distinction easier. Actress Sarah Jessica Parker is a good example of close set eyes, whilst model Kate Moss has wide time for the actual procedure. 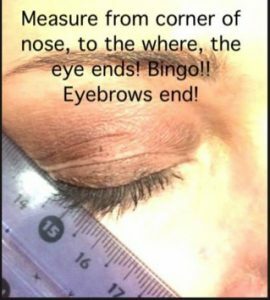 The process now is to quickly produce the brow design and assure symmetry by using a small bendable ruler. By using a dark very sharpened, and more waterproof eyebrow pencil, my design is now more likely to have that stay-on power to keep the template intact. The dark pencil enables me to quickly assess the eyebrow shape and more easily see if they are even or require adjustment. Actress Sarah Jessica Parker is a good example of close set eyes, whilst model Kate Moss has wide measuring tape, six inch q-tip, or tongue blade could be used during the actual procedure. Accurate and safe procedures are always the way to go!